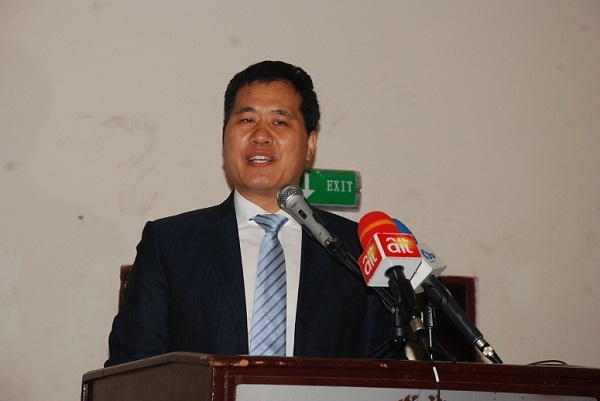 The Chinese Ambassador to Nigeria, Dr. Zhou Pingjian has declared that Africa has been and would remain a priority area for China’s International Industrial Cooperation and that as world’s top manufacturer, China has proved to be a most desirable and reliable long-term partner for Africa in its quest for industrialization. The envoy further described the seminar as “apt and helpful”, coming in the heels of the successful convocation of the 19th National Congress of the Communist Party of China, whose significance and global implications are being assessed in earnest worldwide.” Noting that the successful completion of the 19th National Congress of the CPC last month has reinforced China’s confidence on the path of Socialism with Chinese characteristics, it also opened up a better prospects of mutually-beneficial and higher quality approach to China’s engagement with the rest of the world and particularly Africa, which the envoy believed has given fresh momentum to China-Africa cooperation and China-Nigeria strategic partnership,” adding that the Chinese side is willing to comprehensively advance China-Africa ten major cooperation plans, push forward the implementation of the “Belt and Road” construction in Nigeria and Africa, support Nigeria in implementing its Economic Recovery and Growth Plan (ERGP) and support Africa in implementing the Agenda 2063 and 2030 Agenda for sustainable development. Earlier in his address, director of Nigeria based Centre for China Studies, (CCS) Co-organizer of the seminar, observed that “the important outcomes of the historic 2nd summit of the heads of state and government of the Forum on China-Africa cooperation (FOCAC) which held in Johannesburg, South-Africa in December, 2015 have almost been fully implemented. According to him “China-Nigeria cooperation on industrial and production capacity offers a unique opportunity to realize Nigeria’s strategic goal of economic diversification, and noted that with the shock of the abrupt and steep decline of prices and demand for primary commodities especially oil, the agenda of industrialization could not have come at a better time. The International Seminar, the third in the series of countinous dialogue between China and Africa since the Johannesburg 2nd summit of FOCAC in 2015, has in attendance, the special adviser to the Nigerian President on Foreign and Diaspora affairs, Mrs Abike Dabiri-Erewa, Hon. Yusuf Yacoub Buba, Chairman of Nigeria-China Parliamentary Committee of the Federal House of Representatives, Senator Shehu Sani, Senate Committee Vice Chairman on Foreign affairs, Ambassador Lv Fending, member of the Foreign Policy Advisory Group of the Chinese Foreign ministry and former Chinese ambassador to Nigeria among others, which included diplomats, scholars, industrialists, Women business groups and the media. In keeping with the key resolution of the 19th National Congress of the Communist Party of China (CPC) that “China will keep to the path of peaceful development, hold high the banner of peace, development and cooperation and mutual benefit,” including to “actively promote international cooperation through the Belt and Road initiative and to take active part in reforming and developing the global governance system,” the international seminar in its plenary session, concluded that China-Africa cooperation has entered a matured stage with prospects for more tangible deliverables on Africa’s most crucial challenge of building industrial and production capacity.